Can your truck, SUV, or other vehicle tow a popup camper? 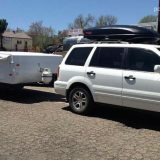 The answer depends on how heavy the camper is, how much of that weight is distributed to vehicle hitch, how many passengers you carry in the vehicle, and several other items we cover in this post about towing capacity. Here’s a great example of trailer weight distribution, the famous towing of the space shuttle Endeavor by a 1/2 ton pickup, the Toyota Tundra. See all those wheels under Endeavor’s nose? 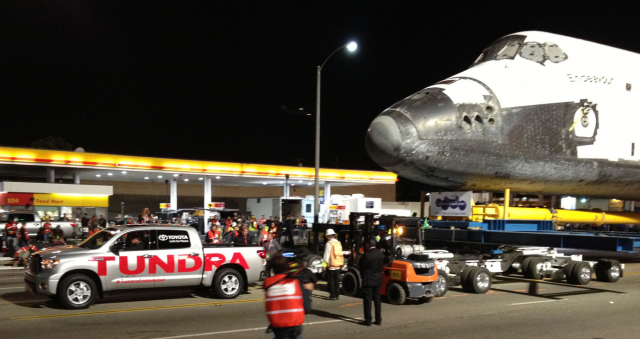 They are bearing the weight of the space shuttle, not the Tundra’s trailer hitch. This photo really proves the point. The space shuttle’s trailer tongue isn’t bearing any of Endeavor’s weight. It’s simply a lightweight harness that one of these people is about to attach to the trailer. In a scenario like this, and with only one driver inside the Toyota Tundra, no cargo, and a trailer hitch weighing probably only 100 lbs, this 1/2 ton truck and many like it can “pull” 10,000 lbs as rated for tow capacity. 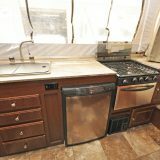 But an RV trailer, even a popup camper, is much different. And, you’re not pulling a popup camper down the flat, closed and controlled streets of Los Angeles…you’re wanting to pull it up and over mountain passes to some amazingly beautiful campgrounds. 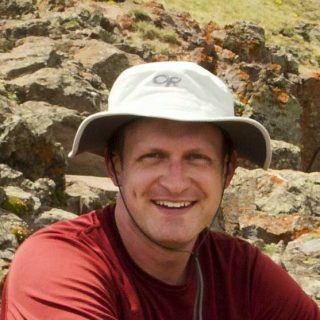 Let’s look at some real world scenarios and how to use some simple math to determine if your popup camper can be safely towed by your vehicle. Vehicle specifications include a Gross Vehicle Weight Rating (GVWR) rating. This is the maximum amount of weight the vehicle can support, including the vehicle itself (often times referred to as “curb weight”). Here’s a sample Toyota Tundra with a GVWR rating of 7,200. You can then look in the user manual to obtain the truck’s base curb weight, which is the weight of that base model vehicle when it left the factory, plus a full tank of gas also accounted for. For our example Toyota Tundra, the curb weight is 5,650 lbs. 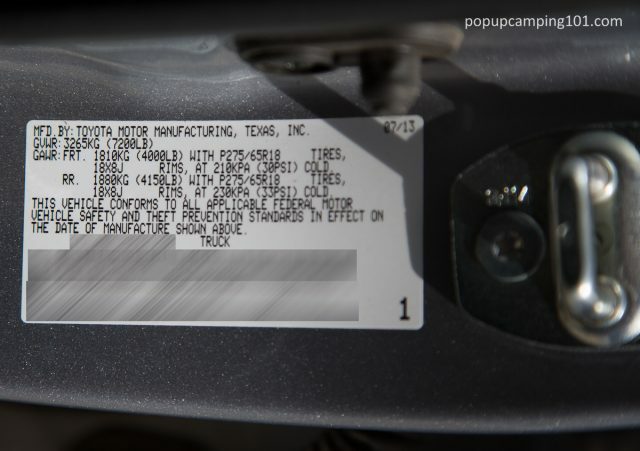 There’s also an additional sticker located in the driver’s door jam that indicates the weight of all optional equipment that was added by the factory since the user manual spec assumes the “base” model without any optional components. 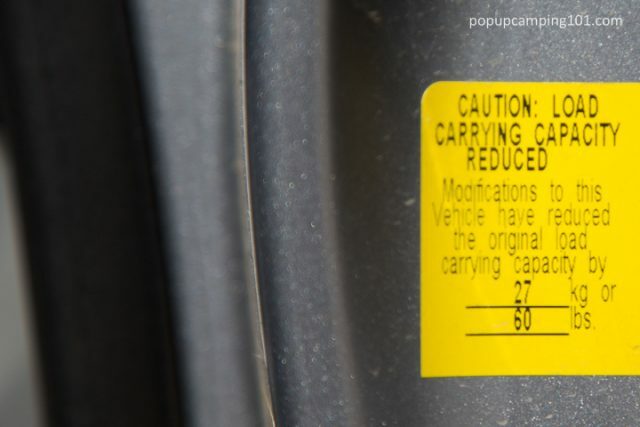 Your vehicle may or may not have this sticker depending on included options, but for the example Tundra, curb weight needs to be increased by 60 lbs for a new resulting total of 5,710 lbs. Finally, you have to account for any dealer or owner added aftermarket equipment plus any permanent cargo always carried inside the vehicle. For the example Tundra, this totals 160 lbs after considering a fiberglass truck topper with roof rack, a child car seat, and a few accessories like jumper cables and a tow strap. 1,330 lbs of payload capacity seem like a lot, doesn’t it? Let’s see if it’s enough. 680 lbs is the maximum amount of hitch weight a camper should place on this example Toyota Tundra. This assumes there are no heavier items like a bike rack, pair of kayaks, etc. sitting in the truck bed or riding on top of a roof rack, all of which would need to be accounted for in the math above before determining your resulting leftover payload capacity for a camper’s hitch weight. Dry Weight: how much the camper weighed when it left the factory floor without propane, water, etc. Unfortunately, most RV dealers will focus exclusively on #1, telling you that a particular popup camper only weighs 2,200 lbs and that your Toyota Tundra’s tow rating is 10,000…so you’ll be fine. But, there are a couple more factors to consider for safe towing. You should also consider the resulting Payload Capacity of your camper (#2/GVWR minus #1/Dry Weight) and determine if this is enough for all the gear you plan to carry in your camper. Some popup campers can carry enough for a dry camper/boondocker with cargo. Others are designed to essentially be towed empty to a full hookups campground. Calculating the estimated hitch weight with actual camper cargo loaded is a bit more difficult. 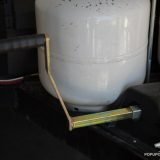 This is because a Dry Hitch Weight specification doesn’t include things that will almost always be in your camper, like a battery and propane tank. There are also common cargo items that must be accounted for, such as the camping gear you store inside the popup and any water you carry during transport. Keep in mind that trailer tongue weight should be about 10%-15% of the total trailer’s weight. Anything less and you will likely experience unacceptable sway when trailering. More will transfer too much weight to your tow vehicle and also tow with difficulty. You can estimate fully loaded hitch weight before even purchasing a camper by getting the weight of each primary cargo item and then calculating how much of that weight will be transferred to the hitch versus the camper axle. 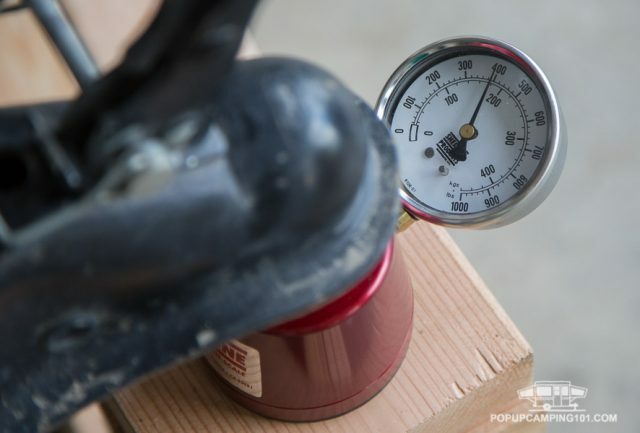 If, for example, you have one standard sized propane tank that weighs 37 pounds, and it is 3 feet from the very front of the trailer (where you hitch to the vehicle) and 6 feet from the trailer’s axle, the resulting tongue weight for this item is 24.66 lbs, calculated as 37 lbs * (6/9). The number 6 represents how close that item is to the trailer axle while the number 9 is the total length between trailer tongue and axle. These are just a few simple examples. 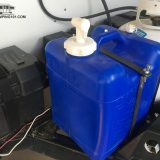 You should account for other scenarios, including a different propane tank/battery configuration, a different size freshwater tank size, cargo items carried on a trailer’s front deck (ie. toy hauler with a four wheeler on the deck), and items carried inside your popup camper box. Additionally, each of these items is likely at a different location on your trailer than the above example ratios assume. One caveat: estimating all of the cargo items carried inside your camper is tricky. There’s bedding, pots and pans, and a whole myriad of different items in various locations within your popup camper. A good rule of thumb is to get the above estimate with all of the permanent, more heavyweight items and then ensure you have enough of a buffer leftover for ancillary items. 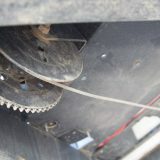 These other items can also be moved around within your popup, including placing them further away from the front of the trailer to decrease the percentage of poundage that is transferred to tongue weight. You can even put items behind the camper axle for an inverse effect. For example, if you place a cargo box halfway between the rear of your popup and the axle, tongue weight is decreased by 50% of that item’s weight. This is the same concept as a playground teeter-totter. You might even have some permanent cargo items like a black water tank mounted behind your axle that helps negatively adjust the estimated tongue weigh calculations above when full of waste water. Just remember to keep your tongue weight at 10%-15% of the total camper’s weight to prevent swaying while towing. Some owners, and even some vehicle or RV dealers, think that a Tow Package or Towing Mode button changes all of the above. This optional package may help with the vehicle’s tow rating, allowing it to pull more weight thanks to an add-on transmission cooler or modified gear ratio transmission, but it generally doesn’t do anything for the payload capacity measurement. One small exception is the Ford F-150 truck, model years 2015 and forward. Thanks to aluminum body construction, the curb weight of this vehicle has been reduced, thus increasing payload capacity over most of its steel-bodied peers. Several F-150 trucks have a payload capacity of 1,800 lbs or higher. A “Heavy Duty Payload Package” (not to be confused with tow packages) further increases this number through the use of a thicker vehicle frame, heavier duty wheels, and other options that when combined together at the factory, increase the truck’s GVWR and resulting payload capacity (as high as 2,600 lbs as of 2018). #1 should never be above your tow vehicle’s GVWR rating. Shouldn’t My Dealer Know All This? Yes. But most of them don’t understand, or at least don’t want to put in the effort…especially because it might result in you not buying a camper from them. There are some dealers out there that not only understand this concept but explain it to their customers and help calculate everything before doing a final weigh-in just prior to purchase. Roberts Sales in Denver, Colorado is one example. They exclusively deal in tent and A-frame popup campers, so conveying this understanding of weight restrictions to potential buyers probably helps them advocate for these types of campers over heavier RVs. It’s a shame more dealers don’t do the same. So what happens if you overload a tow vehicle or camper? If you’re in an accident, you may be assigned blame regardless of the other circumstances, just because you were overloaded and in violation of state law. Your insurance might disclaim responsibility. Both are a liability concern. Your tires may blow out. This is an inconvenience at best but could actually cause an accident. Your brakes might not stop you quick enough. Components will wear down or fail prematurely. Vehicle shocks will start to result in an unpleasant ride both with and without your camper in tow. Your engine and transmission might even wear out from the excess stress placed on it. It is in your best interests, both safety wise and financially, to stay within the proper towing guidelines of your vehicle and camper. All of the above is provided for entertainment purposes, may include mathematical errors and other ommissions, may be based on out of date and now inaccurate information, and should NOT be taken as professional engineering or legal advice.